A workflow view displays the jobs returned as a result of the selected query. The workflow view is divided into sections: the Contents pane contains the job queries, and the main view displays the Job List and job location of interest (LOI) map. Exported ArcGIS Pro maps cannot be used as job location of interest (LOI) maps in the Workflow view. The Job List displays the jobs in a tabular grid format, and the Job LOI Map displays the area of interest polygons and point of interest points for all jobs in the selected query. If an LOI is not specified for a job, the job is not displayed on the Job LOI Map. The Job List and the Job LOI Map can be refreshed by clicking a query. A workflow view is opened in the project when a workflow connection is established. When the workflow view is opened or activated, all the queries configured in the workflow connection are displayed. The jobs displayed in the Job List are, by default, the result of the first query. To set a new default query for the project from either the Public or User queries, right-click the query and choose Set as Default. You must click another query to see the results of a specific query other than the selected query. The name of the connected Workflow Manager user and the name of the database the user is connected to are displayed at the bottom of the workflow view, along with the number of jobs returned by the query. The name of the workflow view is the same as the name of the Workflow Manager database connection. The Public Queries tree displays, and the order is based on the configuration defined by the Workflow Manager administrator in the ArcGIS 10.x Workflow Manager Administrator application. The queries defined by users in the ArcGIS 10.x Workflow Manager client application are visible under User Queries. When the user store is set to the portal user store and a query using the JTX_USERS table is run, any existing users defined for the Traditional user store are cleared from the database. Afterward, if the user store is switched to traditional user store from portal user store, the users must be created manually. If the users are updated in Portal for ArcGIS, it is required that you reconnect to the database and run a query to refresh the user information in the database. The Job List displays the jobs returned from the selected query in a tabular format. The columns displayed are based on the fields defined in the query, and the column name is derived from the aliases defined for the fields. Columns can be sorted by clicking the column name. The Job List supports the selection of multiple jobs. Double-clicking a job in the Job List opens the job view for that job. If a job is selected in the Job List, its LOI will be selected in the Job LOI Map. The text size in the list can be changed using the Zoom slider at the bottom of the view. Increasing the zoom percentage will zoom in and make the text larger, and decreasing the zoom percentage will zoom out and make the text smaller. Alternatively, you can control the zoom factor of the Job List by pressing Ctrl and using the scroll button on your mouse. The Zoom slider does not affect the scale of the map. Expanding a job in the list will display a quick overview of the job's properties and current status. 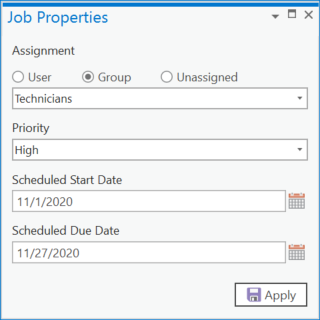 To update the properties of one or more jobs, highlight them in the Job List and click the Job Properties button on the ribbon or from the job list's context menu. 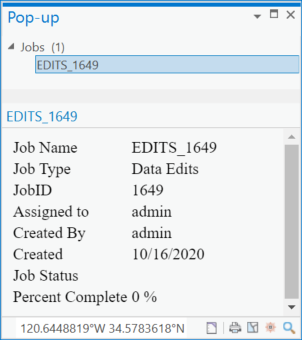 The Job Properties pane appears, where you can update properties for the highlighted jobs in the Job List if you have the required privileges. If you can't update a job after clicking Apply, an explanation can be found in the Notification pane. Job properties cannot be updated for jobs that are offline, deleted, or closed. The results for the current job query can be filtered by typing a keyword and pressing Enter on the keyboard. The Job List is filtered and displays only those jobs that match the keyword in any field of query. Once the keyword is cleared, the Job List displays all the jobs for the job query. The filter keywords are persisted for the session and can be accessed in the filtered list. They can be cleared from history as needed. The Job List filter only filters jobs in the Job List and does not synchronize with the Job LOI Map. 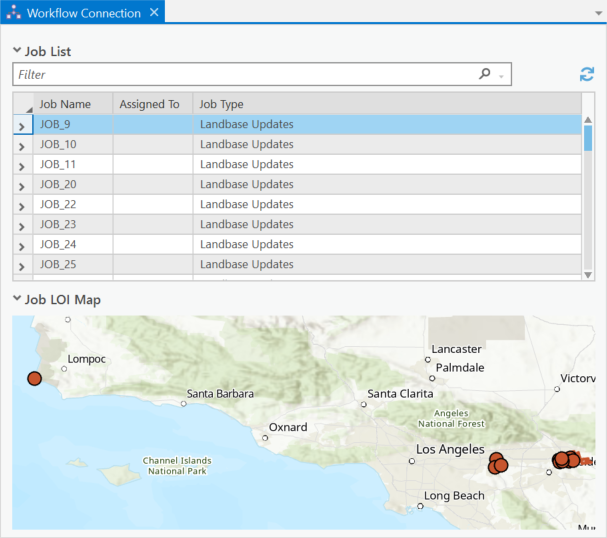 The Job LOI Map displays a spatial view of the jobs in the Workflow Manager repository. You can navigate within the map using your mouse to zoom in, zoom out, and pan. If you click an LOI, a pop-up will appear displaying the basic job properties of the job. If multiple overlapping LOIs are selected, they will each load into the pop-up, and you can navigate between them using the arrows at the bottom of the dialog box. To open a job, click the Job button . To select, highlight, or zoom to the job on the map, use the controls at the bottom of the dialog box. Each LOI selected in the map will be highlighted in the Job List, where they can be opened, taken offline, or edited. On the Workflow tab, you can create jobs, close jobs, edit job properties, export job query results to a csv file, delete jobs, delete a selected job's map and version, take jobs offline, and bring jobs online. A new job is created by creating an instance or a copy of the predefined job template and its properties from the Workflow tab. Creating a job requires the CreateJob privilege. During the life of the job, one or more jobs can be closed at any time from the Workflow tab. Ideally, a job should be closed once its workflow and all actions required for the job have been completed. Closing a job requires the CloseJob privilege. Job query results can be exported to a CSV file on the disk. The file can be used to generate charts and reports. You can view the job query results by opening the CSV file in Excel or share the CSV file with others who have no access to ArcGIS Pro. To export the job query, select the job query in the Content view and use the Export to CSV tool on the Workflow tab. One or more jobs can be deleted from the Workflow Manager database when they are no longer required; for example, deleting closed jobs that are no longer needed will help reduce the size of the database. When a job is deleted, all its information—location of interest, map, version, attachments, history, and so forth—is also deleted from the database, and the deletion cannot be reverted. The deleted job is removed from the project and the Job List, and its job view is closed. However, if deleting the job is not the ideal scenario, you can delete just the version and the map associated with the job. The version or the map can be individually deleted as well if one of them is required to be kept along with the job. There are three options for deleting a job, job version, and job map on the Workflow tab. The last used option is the active option on the tab the next time the functionality has to be used. For example, if you delete the job map, it becomes the selected option on the button; if you have to delete the version later, you'll need to select that option by expanding the button again. The job's version can only be deleted by the owner of the version or by providing the credentials of the SDE administrator of the database. The settings to restrict the deletion of versions are defined in the system settings in Workflow Manager Administrator. However, once applied, these settings are consumed by ArcGIS Pro. Deleting a job, job version, and job map are privilege-based activities and require the DeleteJobs, DeleteVersion, and DeleteMXD privileges, respectively. If you are unable to delete jobs, contact your administrator. In disconnected mode, the options to delete a job, job version, and job map are unavailable. An offline job in the enterprise Workflow Manager database cannot be deleted. Jobs can be taken offline so that you can complete tasks assigned to you when in the field or when off of the network. When you take a job offline, all the necessary configuration elements required for the job to work in the offline mode are taken offline as well. Once the work in the offline mode has been completed, the jobs are brought back online, along with any new information associated with them.